I still have some catching up to do, and I better start with April. Although I kept quiet about it this year, it is worth noting that I was diagnosed with lung cancer in April of 2005. That was more than eight years ago. Or, another way of looking at it; I am into my ninth year of surviving. Also, Mr. Peter Duff turned sixteen on April 20th—yet another important milestone. He is enrolled in a driver’s education class and should have his license within a month or two. 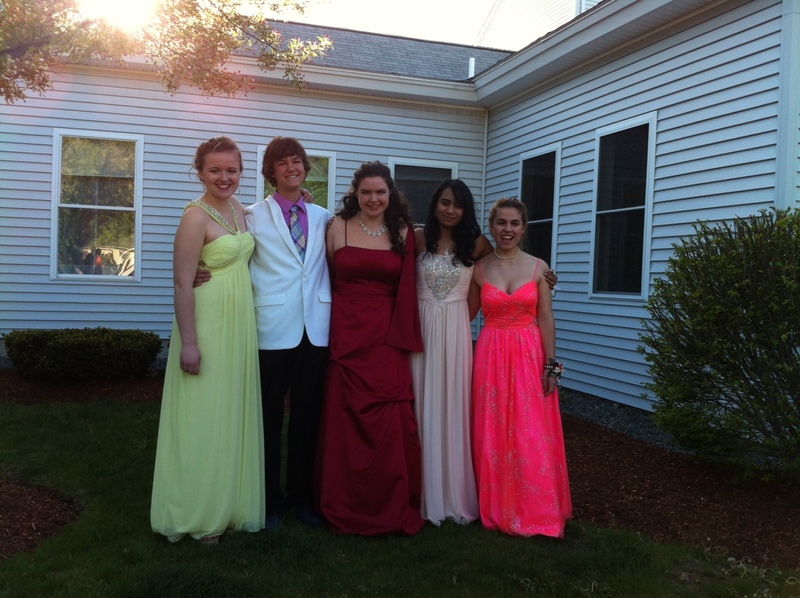 And…he attended his first prom. I was in Austin, but got to serve as wardrobe advisor prior to my departure. That’s my Uncle Roger’s white jacket that Peter is wearing, and I have to say, the kid looks mighty fine (as do his lovely companions). I’ve also had some fun dates with friends. Last week I spent twenty-four hours with Melinda, her daughter Lizzy (who is home for three weeks after completing her first year of law school) and Melinda’s sister-in-law Stephanie. Strolling, shopping and lunch followed by a nap, movie, tapas and a sleepover. Perfect! 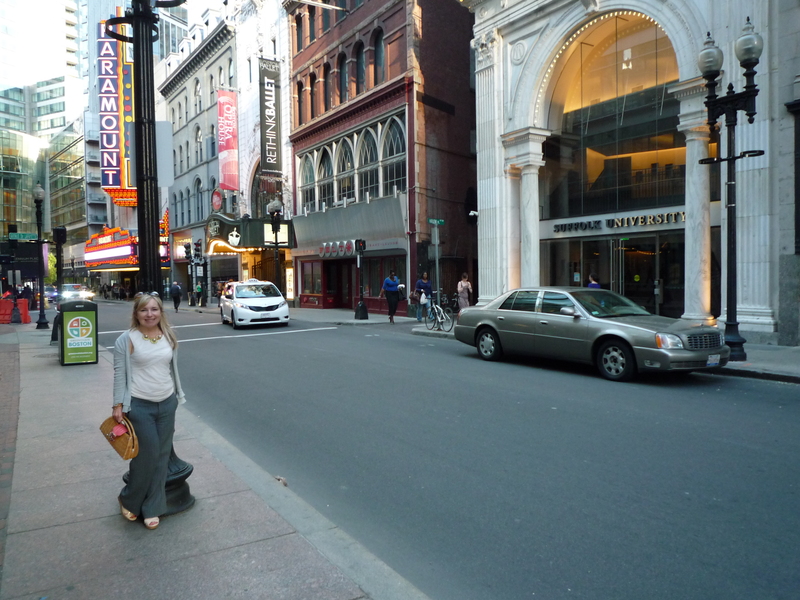 And then, several days ago I joined my buddy Julia in Boston. After a yummy dinner made by her boyfriend Keith (barbecued chicken, asparagus and macaroni salad), Julia and I attended a Boston Ballet performance of Coppelia. It was pure confection; an all around delight. Too tired to drive back to New Hampshire, I crashed on Julia’s guest bed. As a child I seldom slept over at friend’s houses, but now that I’m an adult, it is one of my favorite things to do. Over the weekend it was Peter’s turn to be sociable, as we hosted dinner and a sleepover for a few of his friends. Well, you know you’re getting old when you fail to get a real head count. Four of his guests left after dinner; the following morning I counted thirteen pairs of unfamiliar shoes in the front hall. Normally I would be having chemo in two days, but it has been pushed back a week so that I can travel to Utah tomorrow for my stepfather’s eightieth birthday celebration. Busy, busy, busy! This entry was posted in Milestones and tagged long term survival stage IV lung cancer, stage IV lung cancer. Bookmark the permalink. People’s stories inspire as I now begin Stage 4 of my Odyssey. 9 yrs – yeah!!! I even had the honor of sitting with a 10 years survivor in my oncologist’s chemo lounge. You keep going!!! Patrick, congratulations on the start of yet another year of surviving! Jeepers – you are a busy girl! Glad you’re having some moments (days even!) of joy. Next time you get together with those Lee women you better call me . . .
Jeepers—it’s true. And yes, next time we will call. And do know that I am coming your way—just have to figure out the best time. 9 years is wonderful to hear! I’m hoping for such longevity for my dad…although he was diagnosed at stage 4. He’s 6 months post diagnosis and feeling great. We can’t lose hope! Melissa, fingers crossed for your Dad. Remember, I’ve been stage IV for most of this journey—think possible, not probable. Hope you come have a sleepover at our house soon! Pete looks very handsome in Uncle Roger’s dashing white jacket. Nine years. Wow. Love and more of it. Cristina—coming! Get my bed ready! Hello Linnea, I am a “newbie” to the lung cancer blogs and came across yours. I’ve not read it all the way through yet but I am sure I will do so! You express yourself so very well and I especially appreciate not only your honesty but also your willingness to say in one of your earliest posts that to you it doesn’t matter whether a person with lung cancer was/is a smoker or not–it’s STILL a horrible disease that no one deserves to get! All her lymph nodes were clear. However, the spot in her lung was definitely cancer. She is in her early 70’s and was in the hospital for 8 days due to complications of what they commonly call “i.c.u. psychosis” or “sundown psychosis.” She hallucinated, tried pulling tubes and i.v.s out. It was horrible! Anyway, I’m sorry this is so lengthy! I have to say my mom’s upcoming scan (which was scheduled sooner than normal) is May 28 with appt. for results the next day and I, for some reason do not have a good feeling about this. I hope and pray I am wrong! I like when you said “smacked upside with” – lol. But the point raised about being asked if you smoked is an interesting one. We’ve been hearing that message a long time, thus a natural first curiosity. The answer “no” begs a reactionary, “oh!” or the question, “what else is out there”, or “what else don’t we know”…. Which are good questions. I hope you don’t always feel its implicitly suggestive of anything on your own part, just a natural curious reaction that may lead us to the next step in fighting this. Thanks for the insight!